489 London Road, Glasgow. G40 1NH. The New Monaco Bar. 1991. This old pub has now closed down. To read the full history of this once popular pub click here. The New Monaco Bar, August 2005. In 1893 Hugh Cowan was the popular manager of this old pub, Hugh was born in Kerara, near Oban, one of the most romantic spots in the West of Scotland. Mr Cowan came from a good stock, his father being a well-known farmer in the district and noted for his integrity and worth. Mr Cowan joined the staff at this pub in 1888, he was at once very popular with the customers who patronised the pub. Mr Cowan was a Director of the Employees' Benevolent Institution, Drury Street, Glasgow. In 1974, I played guitar with our small band the New Monaco in London Road... We played in the pub for quite a while.. We had previously played in the Fireman’s Club, almost opposite the New Monaco.. The Fireman’s Club... had later become “SEQUENCE” before being burnt down.. 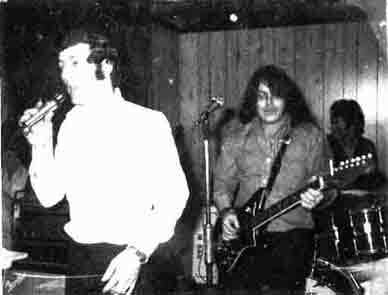 This image of our wee band playing in the New Monaco.. Our singer (Ian Hollis) came from Green Street and had sung in many pubs/clubs around Bridgeton.. He died in 2000. Also see Jim Dillon playing guitar in the Fairfield Bar, Shettleston Road. New Monaco Bar advert 1978. Do you know anything about this pub or any other pub in the city? If so please contact us and we will review your comments. The Greenhead Brewery, Canning Street now London Road. Parts of London Road was formerly known as London Street, Great Hamilton Street, Canning Street and London Road. John McLaren's Bar at 78-80 Canning Street sold a splendid eight penny blend of old Scotch Whisky. Graham's Bar. 18-30 London Road. Kerr's Bar. 150 London Road. International Bar. 415 London Road. The Mecca. 18-24 London Road.
. British Lion Tavern, W R Marney. 166 London Road. Queen Marys' Tavern, Nathan Muir. In 1875 London Street had 6 Pubs. 18 London Street. William Abbot jun. 55 London Street. Andrew Nevas. 80 London Street. John Douglas. 107 London Street. Joseph Neeson. 118 London Street. William Abbot jun. 145-47 London Street at 46 Charlotte Street. Archibald McLaren.